December 17, 2015  The mistrial in the first case in the death of Freddie Gray has left Baltimore residents shocked, disappointed, and still deeply distrustful of the justice system. But legal analysts say the case was never a good fit to address the issues that have been driving national protests around police brutality. December 17, 2015  A mistrial has been declared in the case against William Porter. He's the first of 6 police officers to face trial in the death of Freddie Gray, a black man who died while in police custody in April. 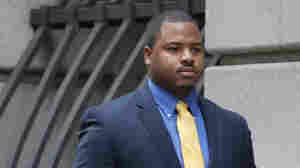 December 16, 2015  A judge declared a mistrial Wednesday in the case of police officer William Porter, who was charged in the death of Freddie Gray. The jury could not reach agreement on any of the charges Porter faced. December 14, 2015  Jury deliberations have begun in the case of Baltimore police officer William Porter who faces a charge of involuntary manslaughter for the death of Freddie Gray. The Freddie Gray Trial Asks: What Happened Inside That Van? 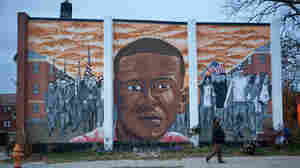 December 13, 2015  In Baltimore, closing arguments are slated to begin on Monday in the case of the first of six officer to be tried for the death of Freddie Gray. We get a recap of the trial so far. December 10, 2015  Baltimore police officer William Porter accused in the death of Freddie Gray has testified in his own defense. Porter says he saw no sign of injury when he checked on Gray in a police van last April. December 9, 2015  The first of six Baltimore police officers on trial for the death of Freddie Gray took the stand Wednesday in his own defense. William Porter, who's been on the force just two years, is charged with manslaughter. Prosecutors say Porter failed to seek medical attention for Gray when he asked for it, and he is also responsible for Gray's fatal injury by not securing him with a seat belt during his transport in a police van. December 8, 2015  Officer William Porter is the first of six Baltimore police officers charged in the death of Gray. Here, some key questions in the trial, and testimony from Porter and others that addresses them. December 8, 2015  William Porter, the first of six officers charged in Gray's death, is on trial in Baltimore. A medical examiner on the witness stand rejected the defense's suggestion that Gray could've hurt himself. December 2, 2015  A jury of eight women and four men were seated Wednesday in the first trial for one of six officers charged in the death of Freddie Gray in Baltimore last April. November 30, 2015  Jury selection began Monday for the first police officer to go on trial in connection with the death of Freddie Gray last April. November 30, 2015  In Baltimore, the trial opens Monday for the first of six officers charged in the death of Freddie Gray. He's the unarmed black man fatally injured after his arrest and transport in a police van. November 29, 2015  The city braces for the trials of six police officers charged in the death of the unarmed black man who suffered a fatal spinal injury after his arrest and transport in a police van last April. 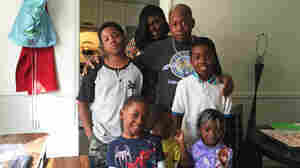 November 20, 2015  In exchange for completing job training and parenting programs, Maryland is writing off some of parents' back child support. Similar efforts across the country are addressing the staggering debt. November 19, 2015  Despite a decades-long crackdown, much of the $113 billion in child support debt will never be paid because those who owe it are too poor. President Obama is proposing changes to address this reality.